UPDATE: Also check out the charge-off rates. The charge-off rate almost doubled for commercial real estate (CRE) from 1.16% in Q3 to 2.04% in Q4. The commercial banks are starting to recognize their CRE losses! The Federal Reserve reports that delinquency rates rose sharply in Q4 in all categories. 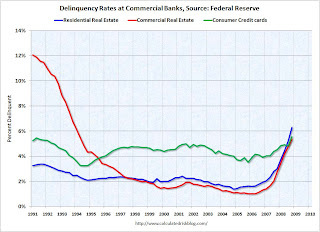 This graph shows the delinquency rates at the commercial banks for residential real estate, commercial real estate and consumer credit cards. Commercial real estate delinquencies are rising rapidly, and are at the highest rate since Q2 '94 (as delinquency rates declined following the S&L crisis). Residential real estate delinquencies are at the highest level since the Fed started tracking the data (since Q1 '91). Credit card delinquency rates are now above the previous high in 1991 (the Fed started tracking data in '91). Although there is credit deterioration everywhere, the rise in these three categories is especially significant. Residential delinquency rates jumped by over 1% from 5.22% to 6.29% - in just Q4! Credit card delinquencies rose from 4.83% to 5.56%, the fastest increase since the Fed started keeping records. And commercial real estate delinquencies rose from 4.74% to 5.36%. The Fed defines commercial as "construction and land development loans, loans secured by multifamily residences, and loans secured by nonfarm, nonresidential real estate", and many of the problems are probably in the C&D loans. These are the loans that will probably lead to the closure of many regional banks. Just more evidence of severe credit problems at the commercial banks.